TORONTO — Denny Lambert remembers plenty about a young Jake Muzzin. There was his size, skill, leadership and an unwavering determination to better himself as a hockey player. What also stood out — perhaps more than anything — was what Muzzin did when he wasn't on the ice. "The best part about him is he's an unbelievable person," said Lambert, Muzzin's junior coach. "This guy cares about his community, cares about his teammates, cares about his family. "He's the kind of person I hope my twin boys grow up to be like. He's respectful, honest, hard-working." The Toronto Maple Leafs acquired Muzzin from the Los Angeles Kings on Monday in a trade aimed at bolstering a blue line viewed as the weak link on a talented roster eyeing a long playoff run. The six-foot-three, 213-pound Muzzin won the Stanley Cup in 2014 with the Kings and instantly becomes an important piece for any potential success his new team might enjoy this spring, possibly on Toronto's top defence pair with Morgan Rielly. But long before this latest twist, the soon-to-be-30-year-old's career was nothing short of a roller-coaster. A veteran of nearly 500 NHL games, Lambert had Muzzin in all four of his seasons with the Ontario Hockey League's Sault Ste. Marie Greyhounds — two as an assistant and two more as head coach. The potential in Muzzin was there, but it was clear the 11th pick in the OHL draft, who sat the entire 2005-06 campaign following back surgery, was a late bloomer in need of help when it came to figuring out his body. "We worked out together to get him to the playing weight he needed to be at — just kind of guiding him in the right direction," Lambert recalled Tuesday in a phone interview from Sault Ste. Marie. "I liked to teach the kids I worked with what it was going to be like in the NHL. How hard it's going to be, how grinding it is. You're going to have some ups and downs, but the key to playing in the NHL is being consistent. "It was unbelievable to watch him develop." Muzzin didn't sign with the Pittsburgh Penguins after they took him in the fifth round of the 2007 NHL draft following his first season playing for Sault Ste. Marie. The native of Woodstock, Ont., re-entered the draft in 2009, but was completely passed over before returning to the Greyhounds as a over-age player. Lambert, 49, said Muzzin struggled to log 20 minutes early on in the OHL, but was registering close to double that by the time he was named the league's top defenceman in 2009-10. "He had something to prove," said Lambert, who played for Anaheim, Ottawa, Nashville and Atlanta. "It's a story of perseverance." 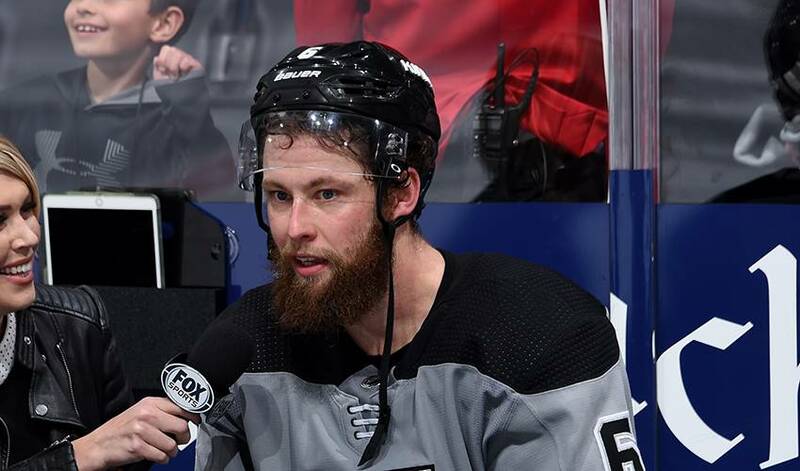 Muzzin eventually signed with the Kings as a free agent in 2010 and established himself as a full-time NHLer in 2013 after 146 games in the minors. In 496 NHL contests, he has 51 goals, 162 assists and 298 penalty minutes. "He became that go-to guy," said Lambert, who went on to briefly coach in the QMJHL with Gatineau and is now an officer with the Anishinabek Police Service. "He did everything really well. He could kill penalties, he could play on the power play, great first pass, good shot. "He was a professional even back then." Familiar with Muzzin from his time as a Greyhounds scout, Toronto general manager Kyle Dubas said acquiring the defenceman for two prospects and a 2019 first-round pick checked a lot of boxes. The on-ice component, playoff experience — his 50 games immediately puts him second on the Leafs — and the fact he's signed through next season at a reasonable US$4-million salary cap hit are huge, but Lambert said Muzzin's presence in the locker-room can't be understated. "He was my captain and he was the leader," said Lambert, "I didn't have to worry about the team because I knew when we spoke, he'd let me know how the team was doing and what we needed to do to correct things. "He was a great leader at communicating both on and off the ice." Lambert said he hasn't spoken to Muzzin in quite some time, but is eager to follow this next chapter. "You get emotional because you know how hard he worked and how hard he's working to stay where he's at," Lambert said. "It's a true story of how you can make it. "The energy that he put in, the determination and the drive and the never-quit attitude ... it's quite the story."